3BR Oceanfront Condo on Ground Floor! Our condo rental is located on the New Smyrna Beach peninsula, a 14 mile long island on the Atlantic Ocean. It is on the ground floor (no steps) and is directly on the ocean. 30 minutes to Daytona Beach and 45 minutes to Orlando. 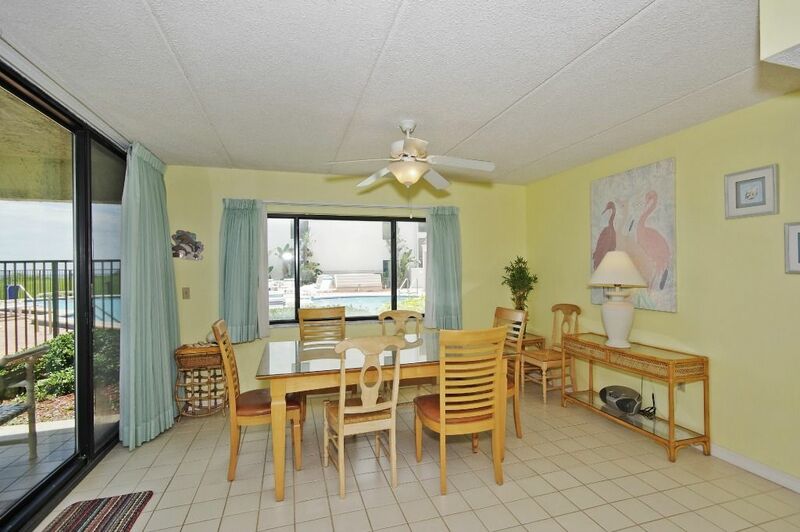 Frontage on both the Ocean and Intercoastal Waterway! Want some ideas of things to do while you are here? How about these: Swimming (ocean & heated pool), Shell collecting, Fishing (surf, deep sea and river), Walks on the beach, Surfing, Boating (dock across street at Intercoastal), Water Skiing, Tennis, Shuffleboard, Wildlife viewing and bird watching (Canaveral National Seashore is five minutes down the beach!! ), Space Shuttle Launches (we are 1/2 hour North of Cape Kennedy), three parks within five minute walk, and several golf courses nearby. (2) Big screen TV in living room. Additional TV in master bedroom. What a joy to stay in this spacious three bedroom, two bath condo right on the beach and steps from the heated swimming pool.. As a family of five looking for the perfect place to enjoy Christmas, we found this to be perfect spot. This condo was stocked with everthing we needed except paper products and food. The open concept great room with a dining table that would seat 7, made great place for games. The kitchen has plenty of dishes and cookware, and there is a microwave and dishwasher. It was clean and ready for us on arrival. Our host was quick to answer texts for questions.. Shopping is about 10 miles away, but once we stocked up, there was little need to leave the condo. Sadly, the Canaveral Seashore National Park is just down the road was closed for the government shutdown. However the Kennedy Space Center is an hour away, and we watched with awe the SpaceX rocket launch,. If you book this location, you won't be sorry. So glad that you enjoyed your holiday stay! We have many wonderful memories of our family vacations at the condo and are always pleased when another family has a similar experience!